Today's challenge is to look at your childrens' snacking habits and change them for the better. Kids who eat too many snacks, sugary snacks, or snacks that are not well balanced, are less likely to eat well at meal times. They may be too full from snacking or they may be "starving," and craving sugar and carbohydrates due to a sugar high and then sugar crash. Additionally, if they are eating sugary snacks, or "white flour" carbohydrate snacks without protein, fat, or fiber to help slow their absorption, they may be hyper, moody, or cranky, which can further impede good eating at meal times. Rather than thinking of snack time as a time for treats, think of it as a bridge between meals and a way to help your children maintain balance between meal times. You are much better off giving your children "treats," immediately after lunch or dinner when they will be balanced by the full meal that they have just had. 1. Decide when and how often snacking will be allowed. Generally one snack mid morning and one snack mid-afternoon will help to maintain balance between meals. 3. Make a list of acceptable options, or plan a snack for each day/ mealtime. 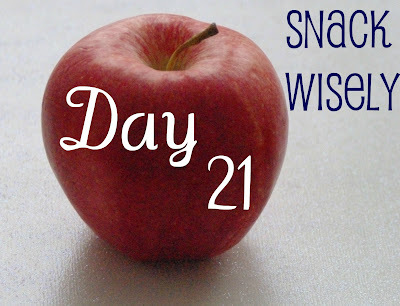 Consider adding snacks to your weekly meal plan even if you don't have it split up by days. 4. Determine whether you will serve the snacks to your kids, or if you will set up a system so that they can serve themselves. 5. Put acceptable snack options in one particular area of the pantry, refrigerator or both so that there is no question and no "searching," through unacceptable options. Put special treats/ deserts in a less acceptable and possibly hidden area. 6. Consider pre-making and pre-packing healthy snacks such as homemade granola bars or protein bites. Need Some Ideas for healthy snacks? Six Sisters' Stuff has a great list of 100 Healthy Snack Options which includes a printable list. Snacking around our house has become rather boring so I'm going to be scouring some of my cookbooks, magazines (and of course, Pinterest!) for some ideas. I'll be sharing what I've found over the course of the next few days. What are your favorite healthy snacking options?